As former president of the United States of America, it’s only normal that people would be curious about him, his roots and what he is all about. So today it’s time to find out more about the people closest to him… his family, beginning with Barack Obama’s mother. 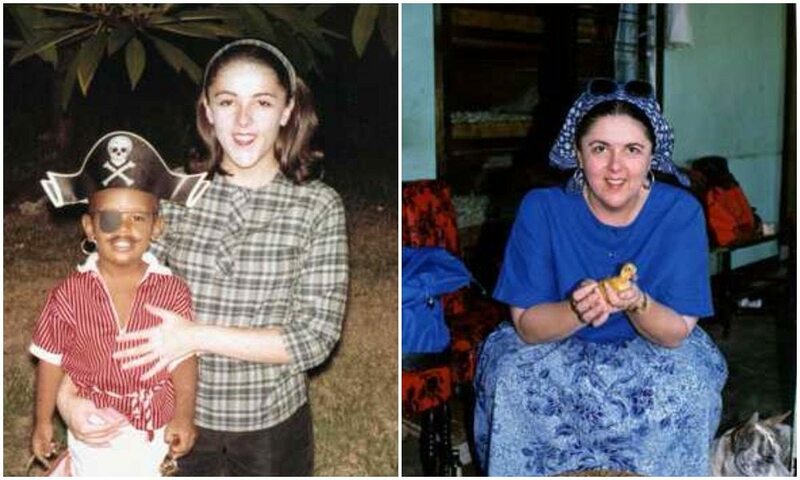 Her name was Ann Dunham and she was born in Wichita, Kansas. Ann was an American anthropologist and she spent most of her adult life in Hawaii and Indonesia. Barack Obama’s mother was an accomplished woman before her death. It just goes to show that the apple doesn’t fall far from the tree. She got a bachelor’s of anthropology, master’s and PhD in anthropology from East–West Center. This was at the University of Hawaii at Manoa in Honolulu. She also attended University of Washington at Seattle from 1961–1962. After that she developed an interest in craftsmanship, weaving and the role of women in cottage industries. Dunham’s research focused on women’s work on the island of Java and blacksmithing in Indonesia. Towards the latter part of her life, she worked with Bank Rakyat Indonesia. There she applied her research to the largest micro finance program in the world. She died in 1995 in Hawaii following the unsuccessful treatment for ovarian and uterine cancer. Barack Hussein Obama Sr. was born on 18 June 1936. He was a Kenyan senior governmental economist. He was selected for a special program to attend college in the United States. This enabled him to study at the University of Hawaii. That was where he met Barack Obama’s mother and the two got married in 1961. After he divorced Barack Obama’s mother, he remarried and divorced again. Nevertheless, he was also quite accomplished in his field, but towards the end of his career he got into a bit of trouble. Obama Sr. first worked for an oil company, before beginning work as an economist with the Kenyan Ministry of Transport. He gained a promotion to senior economic analyst in the Ministry of Finance and had some disagreements with Kenyan President, Jomo Kenyatta which led to him being fired and black listed. During his last years on earth he was involved in 3 serious auto crashes and the last one claimed his life in 1982. Well, Obama actually has a very large family; he has a total of 8 half-siblings from his mother’s two marriages and his father’s four. Here is a list of all his siblings from the oldest to the youngest. The first is Abon’go (Roy) Malik Obama and his parents were Barack Obama Sr. and Kezia Obama. Then came Mark Okoth Obama and David Opiya Obama from the union of Barack Obama Sr. and Ruth Baker. While still with Baker, Obama Sr allegedly sired two more sons, Abo and Bernard Obama. Maya Kassandra Soetoro was the product of a union between Ann Dunham and Indonesian Lolo Soetoro who she remarried in 1965. Then came the last of the brood, George Hussein Onyango Obama in 1982 from a relationship with fellow Kenyan, Jael. It’s no easy feat being the daughter of the most powerful man in the world, and we bet Malia and Sasha can tell you this. For eight years, the girls have grown up in the public eye while still trying to have personal lives… as confusing as that sounds, we can all agree that they succeeded to an extent. The oldest, Malia, was just ten years old when her father entered office, what a thrill and a scare it must have been for young Malia at the time. Since then, the world has watched her blossom into the young woman she is today, through the lens of the media. Having her mother, the very lovable Michelle Obama, as a role model, Malia certainly has very big shoes to fill in future ( no pressure there). We are after all meant to surpass our parents in terms of success, aren’t we? Well, this president’s daughter is already on the right path. She recently just graduated from Sidwell Friends School and got admission into the prestigious Harvard University, where she will become the latest in a long line of presidential children to receive her tertiary education at the institution. Her parent’s have tried to provide her sister and her with some semblance of a normal childhood. Malia and Sasha were named two of The 25 Most Influential Teens of 2014, they aren’t really on social media or ‘out there’ per say, but they have carved a niche for themselves as far as teenagers and the world are concerned. Nevertheless, Malia is still daddy’s little girl and the former president himself has referred to her as “one of my best friends”. Sasha on the other hand has people wondering what the next step is for her. According to Yahoo News, the youngest of the family, Sasha, has avoided scrutiny compared to reports of what her sister and parents will do, begging the question: What’s next for Sasha? Well here is the answer in plain words, being that she is still a freshman at Sidwell Friends School, the former first family will be remaining in Washington till she completes her secondary school education. Here is what Obama himself said pertaining to that at a restaurant while visiting Milwaukee voters in March.